Hi, we're Dale, Carrie & family! We started converting our backyard from an urban lawn into a food farm in 2015 and now you can do the same using our free iOS & Android mobile app! 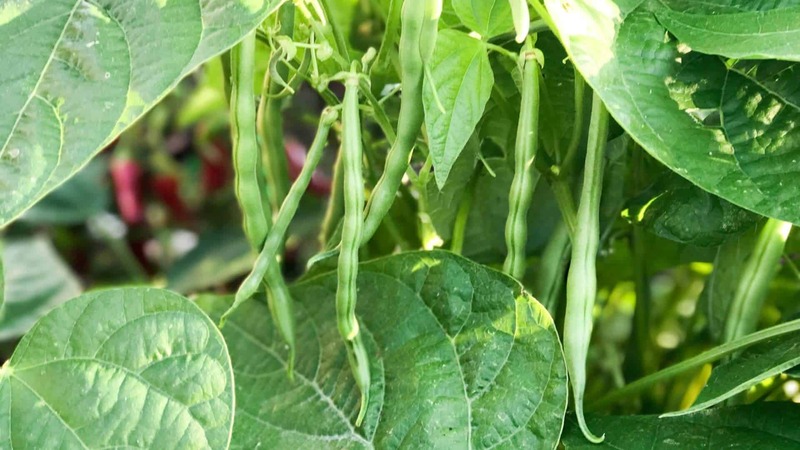 Growing your own food doesn't have to be difficult and we're here to show how you can grow your own organic produce economically, efficiently, and sustainably! You can read the story below of how we converted our lawn and keep up with current developments on our blog. You can also sign up for email notifications when we post new videos, blog posts, and events and follow us on Facebook, Instagram, Twitter, or YouTube. Click here to read Dale's story about weight loss, anxiety, depression, and how it led to finding love & growing food! Click here to see a recorded presentation about weight loss, anxiety, depression, and how it led to finding love & growing food! We started our journey on a typical Oklahoma Bermuda grass lawn. Our first purchase was the Square Foot Gardening book and built two 4ft x 4ft beds using the methods outlined in the book. We still subscribe to many of the ideas learned from this book but have adapted and combined ideas from many different sources. For example, the book recommends using black weed cloth below the beds to prevent weeds from growing up through the soil. We found that the Bermuda grass just grew right through the cloth and we spent too much time pulling grass out of the raised bed. We now lay thick sheets cardboard below each raised bed. We get the benefit of blocking out the sun so that the Bermuda grass doesn’t grow and the cardboard will feed and encourage worm activity as it breaks down. We fill all of our raised beds with a slight variation of the “Mel’s Mix” (1/3 Vermiculite, 1/3 Peat Moss, 1/3 Compost) found in Square Foot Gardening (Here’s a video showing how we mix it together easily!). The most important ingredient of the soil mix is compost: decayed organic matter that’s nature’s free source of food for plants. As living things die and break down, the nutrients within them are returned to the soil as compost. We realized soon after starting that we were going to need A LOT more compost in order to expand our garden. We built our first compost bins by zip-tying shipping pallets together. Instead of making our own compost, we saved some time and filled them with compost from a local municipal compost facility. We now make all of our own compost by combining as many sources of organic material as we can. Here are some examples of the types of free “ingredients” we use: used coffee grounds picked up from Starbucks/7-11, wood chips from the local municipal wood chip pile, leaves collected in the fall, plants I pull up or chop down from the garden that aren’t diseased, grass clippings, and kitchen scraps. We welcomed our 3rd daughter Marianne to the world in June and her appetite immediately informed us we needed to expand our garden! We built our first 4 ft x 8 ft bed that we planned to use for a fall crop of lettuce and spinach. Brooklyn and Daphney asked for their own garden so we built them a 3 ft x 3 ft garden and let them plant whatever they wanted. This has turned out to be one of my favorite places in the garden because it’s always filled with color and reminds me of them when they’re away. We also built one of our “raised beds on legs” for the first time. The sun is farther south in the winter in the northern hemisphere and the fence casts a shadow over the raised beds on the ground. Elevating them a few feet off the ground allowed the plants to receive sunlight in the winter. By then gardening had hooked us and we knew we’d be expanding a lot more soon. It wasn’t going to be economical for us to keep buying wood at the rate we were going so we had to get creative. We started collecting scrap wood from houses that were being built around our neighborhood (always ask someone first), Craigslist, and any other source I could find. We learned a lot of things over the summer but probably the most significant was that Bermuda grass can be a nightmare to deal with. We were tired of pulling it from the garden constantly and mowing/weeding around the beds had become a chore. We decided to address the problem by eliminating grass around the raised beds. To do this we turned to our old friend cardboard. We laid a thick sheet of cardboard everywhere around the raised beds and covered it with a 1 ft thick layer of wood chips. Over time this strategy has pretty much eliminated Bermuda grass from the raised beds. We also prepared to grow over the winter for the first time. We built a greenhouse for the 4 ft x 8 ft bed out of PVC pipe and clear plastic from a hardware store. We planted each row with a different type of lettuce or spinach and held the plastic in place with cheap spring clamps. 2015 humbled me. We didn’t have nearly the results we wanted and I realized I had a lot more to learn about growing food. As a result, I dedicated the winter of 2015 to learning as much as I could. I stopped watching TV and replaced the time with reading gardening books and blogs. I watched hours of YouTube videos from One Yard Revolution, OSU’s Oklahoma Gardening, and anything else I could find. I joined a local Facebook group with over 3,500 people that share ideas and tips constantly and read every post. I found the You Bet Your Garden podcast and listened to episodes while driving. Gardening pretty much took over all of my spare time. In preparation for spring, we also began to build more of the “raised beds on legs” and covered more of the yard with cardboard where we knew we’d want more raised beds. The hoop house we built in the fall allowed us to harvest lettuce and spinach all winter and we were starting to see the benefits of growing our own food. We found that we ate many more salads than before when we had to rely on making trips to the grocery store to have it. We also spent a lot of time out in nature over the winter. We love to go camping at one of the local state parks as often as we can. I realized while out on a hike one day that the forest is the perfect place to study if I want to see how plants thrive without human interaction. This realization pushed me towards a different way of viewing gardening and in turn, I studied more about “natural” and sustainable growing methods such as Back to Eden. Up until the spring of 2016, we hadn’t spent much time trying to figure out how much we’d have to grow of each crop in order to sustain ourselves. We spent a lot of time researching and planning over the winter and had everything calculated and ready for the spring. We knew we weren’t quite at the point where we could grow all of our own food, but it was beginning to look feasible. All of the new raised beds we built required more soil so I spent a lot of time mixing ingredients to make our soil mix. This is when we figured out a much more efficient way to mix all of the ingredients together using a compost tumbler. Adding more gardens required me to become more efficient with my time so I began to think about other ways to manage all aspects of the garden and to be more efficient. We also added a rabbit to the mix so we could begin to produce more of our own fertilizer. Towards the end of the spring, we were beginning to harvest more food than we could handle and were starting to appreciate the benefits of all the work we’d put into the garden. I lost my grandfather at the end of spring. He was the most influential male role model throughout my life and the man that taught me how to be a man. I can’t begin to count how many late summer nights I spent with the shovel when I couldn’t sleep. That’s when I really started to feel the therapeutic effects of gardening. The garden became my place of quiet whenever I needed to get away. I can’t fully explain it, but there’s something uplifting about digging in the dirt. The energy I poured into the garden late at night translated into an explosion of garden space. We built 5 more beds adding nearly 200 more square feet of growing space. We grew tomatoes, squash, watermelon, cantaloupe, cucumbers, corn, beans, okra, 24 different types of peppers, basil, oregano, rosemary, thyme, lavender, catnip, and lots more. The idea of growing 100% of our vegetables was beginning to look like a reality. Keeping up with watering all the new garden space proved to be nearly impossible in the brutal Oklahoma summer. I knew I needed a better irrigation system if I wanted to be successful at growing food in the heat. I’d also been interested in collecting rainwater for irrigation and decided now was the time to take on both projects. I watched hours of video on YouTube and decided on using IBC totes to collect rainwater. I found them on Craigslist for $75 each and connected them to the gutters on my house using standard PVC pipe and fittings purchased from a hardware store. I also connected the gutters on my shed to a smaller 55-gallon barrel using the PVC pipe and fittings. This gave me a total of 605 gallons of water storage. That sounds like a lot, but my garden requires approximately 600 gallons of water a week in the summer. You may think it’d take awhile for the totes to fill up just from rain, but I calculated how much water my roof should collect and I should be able to catch around 500 gallons of water for every inch of rain and I’ve found this to be pretty accurate. My next task was to find a way to get the water from the IBC totes out to my plants. I researched all the various drip irrigation methods and decided to stick with PVC. The standard black irrigation tubing is a great option as well, but I went with PVC after calculating out costs and finding it to be significantly cheaper for the scale of my garden. It involved a bit more work, but it’s worked out great and I’m happy with the decision. I simply cut 1/2″ PVC pieces to the width of the bed, drilled 1/16″ holes every 3 inches along the pipe and connected them together with standard fittings along the main arm with a cap at the end of each line. I connected a hose from rainwater totes to the garden and now watering is as simple as turning a handle on the tank and setting a reminder on my phone to move the hose to another bed after 30 minutes. The summer also taught me that I needed to have raised beds that are shaded in the afternoon. It simply gets too hot for many plants to flower and produce food in my main garden area that gets full sun all day once July/August comes around. I measured the temperature difference between the shaded area to the east of my house and found it’s 20-30 degrees cooler there in the afternoon compared to the middle of the yard. In turn, I built two new raised beds along the house and along the shed with the hope that the cooler temperatures in the afternoon would allow me to have better success during those months next year. I also decided it was time to rebuild my compost bin. My zip-tied palette approach worked fine, but I wanted to build something more sturdy that allowed me to change the height of the front. I decided to build it using the wood from shipping pallets I’d been gathering throughout the summer. I found that tearing the pallets apart is pretty easy once you have the right tools! I move everything from one bin to another every week or so and this made the process much easier! Here’s a video with all the details on our compost bin and we make compost! The one trouble I had with my first attempt at a hoop house was that it was somewhat a pain to harvest things. I had to detach the plastic, lift it off, harvest, then attach it back. I saw this video showing how to build a hinged hoop-house and thought it was a brilliant idea. We used 2×4’s to build a frame that sat on top of the raised bed and then attached the PVC and plastic to the frame. Then we secured the frame to the raised bed using door hinges and now it’s much easier to harvest in the winter! Here’s a video showing it in action. The winter of 2016 brought many new things into our lives, namely our first son, “Junior”. We waited until birth to find out the gender and it was truly one of the most special moments of my life. He came into this world with a smile and it’s rarely left his face since. This is also when we decided to launch From Seed to Spoon. I started working on the website on Election Day and we launched it a few months later! And lastly, we adopted our husky, “Minnie Mouse”. We lost 10-15 melons due to field mice over the summer and fall and we brought her in to solve the problem. Over the course of the next few months she took out 20-30 mice and we’ve only had traces of them since.